I finally made it down to Dent’s heritage gloves factory in Warminster, and learnt a lot more about the traditional process behind English-made gloves. There were some interesting parallels with several other crafts, including tailoring, shoemaking and shirt making. The leathers used most often are hairsheep, deerskin and peccary. Hairsheep comes from African sheep that, as you could have guessed, have hair rather than wool. It is very thin while remaining strong and flexible, and is most often used for women’s gloves, though British army gloves are unlined hairsheep. Deerskin is thicker, from North America and has a grain, which hairsheep does not, and peccary is softer, from South America and with a distinct pattern of three-bristle holes. The skin is soaked to make it more malleable and then cardboard patterns for the two gloves laid on each side of the spine. 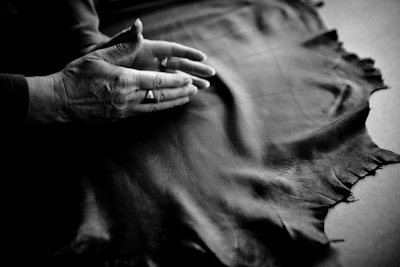 The leather is stretched again slightly by hand along the length of the glove, squeezing perhaps 11.5 inches of leather into a 9-inch wide pattern. This is so that when you put the glove on, it stretches across the palm to allow easy access but then springs back to its previous shape. The cutter then marks around the pattern with his nail – the cutters have rather long nails for this purpose. Rather like chalk on worsted, the nail impression can be removed without leaving any trace. That square of leather is cut out with shears. These look rather like those used to shear sheep: wide-handled and made from one piece of metal, without a hinge. 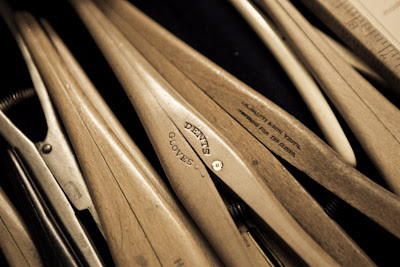 Shears that would be more recognisable to a tailor are sometimes used, but one-piece shears are simply quicker to pick up and put down. Marking with the nail is also valued for this reason. 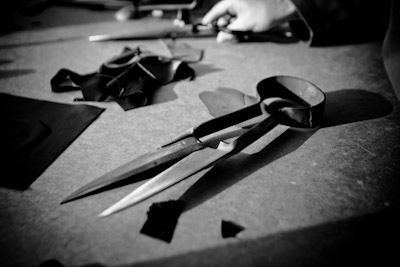 The purpose of the table cutting is to select the right area of the leather, without any blemishes and matching both gloves. The actual cutting of the glove shape, however, is done on a hand-shaped metal frame. The leather is stamped down onto its sharpened edges with a hydraulic press. 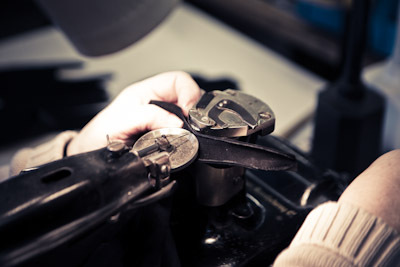 The cutting of gloves is therefore a mixture of the two methods used for cutting the leather for shoes – clicking by hand and using a press. For each size of glove there is a different frame and, while each has the same proportions of palm size to finger length, there are inserts that can be used to shorten or lengthen the fingers. Dent’s used to make versions with shorter fingers for the army and for Japanese customers, but that has ceased to be economic. It doesn’t at present offer a bespoke service either, largely because of the difficulty of getting people measured accurately at the various department store concessions. Next, the gloves are stitched together. Along with the main part of the glove, there is a separate thumb, three fourchettes (the gaps in between the fingers) and usually three quirks (triangular pieces also used between the fingers, to allow them to move more easily in different directions). Add on the same number of pieces for the lining (minus quirks), as well as any straps and hardware, and you have up to 52 pieces that have to be assembled. The stitching is done on old Singer sewing machines. They are so old that they pre-date those in Singer’s own museum, and the only way to repair them is to harvest equally old models that Dent’s collects. These machines also stitch horizontally. A flat-bed sewing machine, with a vertical needle, doesn’t allow you to turn the glove in enough directions. The bed itself prevents you from moving the glove underneath the plane of the table. I remember being impressed by the dexterity with which Turnbull & Asser’s seamstresses worked around the points of shirt collars on their flat-bed machines. But seeing a glove being sewn, you realise that method’s limitations. Some of the gloves are also entirely sewn by hand. It’s easy to spot those because the stitching is much bigger and more noticeable. Interestingly, I find that men tend to assume the gloves with finer stitches and with stitching inside the glove (inseam, as opposed to prixseam) are of better quality. But the first is done by machine and the second is much easier – like the inside of a jacket, turning the seam in allows you to hide any mistakes. Finally, the gloves are ironed. This is largely a question of presentation. When the gloves have been sewn they look just like they will after someone has worn them a few times – soft and crumpled. For retail, though, they must be smoothed and pressed. This is done on a heated metal hand-form, on which the gloves are placed and stretched finger by finger. 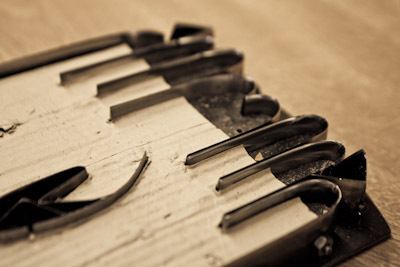 And a very traditional tool is needed to straighten out the tips – half a wooden clothes peg. There’s one for every colour of glove. Thank you to John, Jeremy and everyone else who showed us around the Dent’s factory. Good luck in your new premises. The trip also included a tour of the Dent’s archive, with gloves made for Charles I, Elizabeth I and Nelson (with real blood stain). More on that another time. You can follow the discussion on Factory visit: Dent’s gloves by entering your email address in the box below. You will then receive an email every time a new comment is added. These will also contain a link to a page where you can stop the alerts, and remove all of your related data from the site. Do soldiers have shorter than average fingers then? Thanks Scott. Yes, the Heritage collection is certainly worth going for. I’d probably opt for Merola today though, to be honest. I appreciate your honesty. Why would you opt for the Mercola glove? That’s what I need to know, thank you. What model or models would you recomend and in what leathers?